In October and November, printer and copier OEMs reported quarterly financial results for the three-month period ended on September 30, 2018. For all the Japanese OEMs, except Canon, this period was the second quarter of the year ending in March 2019. For Canon and Xerox, this period was the third quarter of the fiscal year that will end on December 31, 2018. HP is on a different financial calendar than all the other OEMs. Its fourth quarter and fiscal-year 2018 ended on October 31, 2018. Actionable Intelligence currently covers financial results from traditional printer and copier OEMs including Brother, Canon, Epson, Fujifilm, HP, Konica Minolta, OKI, Ricoh, Toshiba Tec, and Xerox. Our detailed coverage of these companies’ financial performance is available for Actionable Intelligence subscribers. Key takeaways from these companies’ most recent financial quarters are as follows. After a relatively upbeat year for most OEMs in 2017, 2018 is proving more challenging for many firms. This trend, which began in the quarter ended in June (see “The Big Picture: OEM Financials for the Quarter Ended in June 2018”), continued in the quarter ended September 30. In the quarter ended in September, the “winners”—firms that posted both revenue and operating income growth year-over-year in their printing businesses—included Canon’s Office business, Epson’s Printing Solutions business, HP’s Printing business, and Konica Minolta’s Professional Print business. 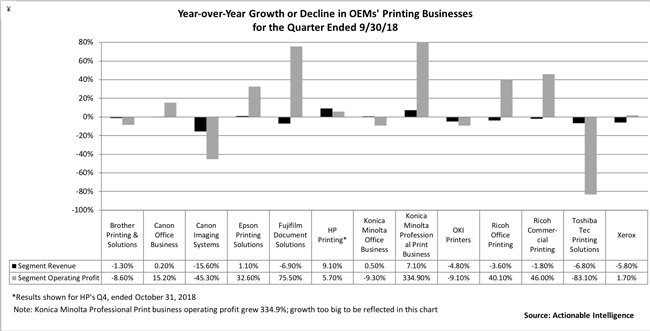 The roster of OEMs whose printing businesses saw year-over-year declines in revenue and operating profit in the quarter included Brother’s Printing and Solutions segment, Canon’s Imaging Systems business, OKI’s Printers business, and Toshiba Tec’s Printing Solutions business. The businesses that posted the biggest downturns were Canon’s Imaging Systems business, although much of the decline was due to the camera segment, and Toshiba Tec, which saw decreased sales of MFPs overseas, especially in the Americas and Europe. Several OEMs reported mixed quarters. Fujifilm is in the midst of restructuring its Document Solutions business. As a result of its decision to shift away from low-end printers, profits were up but sales were down in this segment. Konica Minolta’s Office segment reported very modest revenue growth (less than 1 percent), but the group’s operating profit shrank. Ricoh reported lower sales but higher operating profit in both its Office Printing segment and its Commercial Printing business. 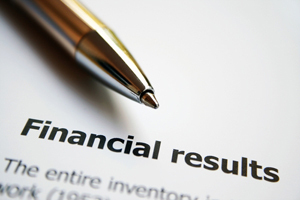 Xerox reported a revenue decline but increased operating profit due to cost cutting. HP closed the books on a very strong fiscal 2018, in which its Printing business received a big boost from its acquisition of Samsung’s printing business. HP posted double-digit year-over-year revenue growth in both Q4 and the full fiscal year. Operating profit was up by double digits in both the three-month and twelve-month periods. Net earnings more than doubled in both periods as well. Of the 10 major OEMs we track, six (Brother, Canon, Epson, Fujifilm, Konica Minolta, and Ricoh) adjusted their forecasts for fiscal 2018. Brother, Epson, Konica Minolta, and Ricoh raised some targets. 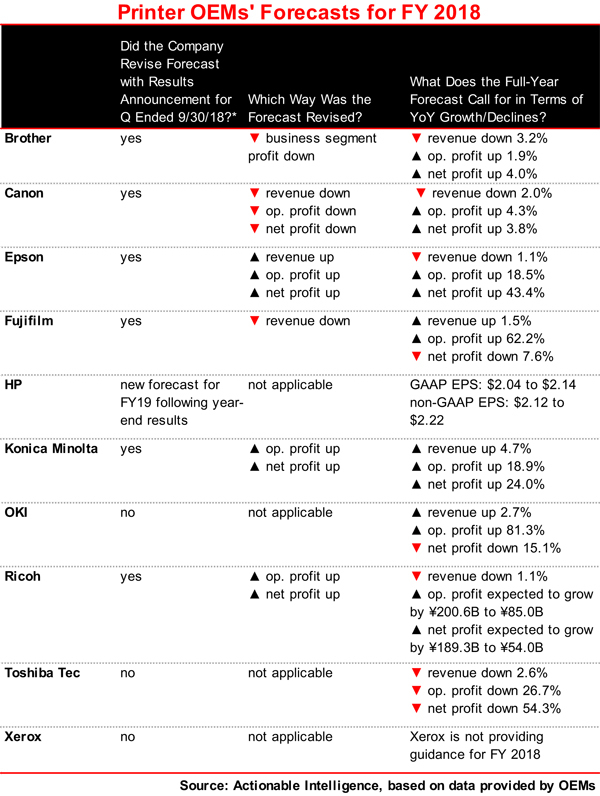 Canon and Fujifilm revised forecasts in the opposite direction. HP issued its guidance for earnings per share (EPS) in fiscal 2019. If you want the most up-to-date information on printer OEMs’ financial performance, legal issues, new product introductions, and other topics impacting the printer and MFP hardware and supplies industry, subscribe to Actionable Intelligence.